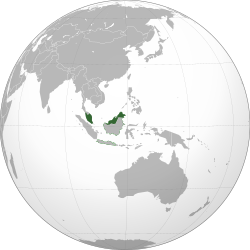 ^ e. Before the accession, Sabah was referred to as North Borneo. ^ f. Singapore became an independent country on 9 August 1965. ↑ "MALAYA: Independence by 1957". Time. 20 February 1956. Retrieved 22 April 2012. ↑ "Sarawak Independence Day Should Have Been July 22 Not Sept 16?". Bintulu Weekly. 20 March 2011. Retrieved 22 April 2012. ↑ "SABAH INDEPENDENCE DAY ON AUG 31,1963". Sabahkini.net. 11 September 2011. Retrieved 22 April 2012. ↑ 8.0 8.1 8.2 8.3 "Malaysia". International Monetary Fund. Retrieved 19 April 2012. ↑ Wong Chun Wai; Edwards, Audrey (4 June 2007). "Back to Bahasa Malaysia". The Star. Retrieved 26 October 2010. ↑ "Federal Constitution" (PDF). Judicial Appointments Commission. Retrieved 29 November 2011.